ASLComp variant that brings the desert to your gaming table using a new geomorphic desert board in quantities of one or more, new color counters, and an overlay collection. 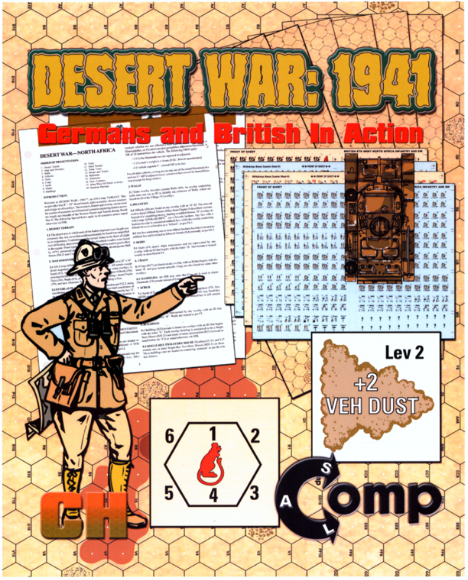 This set provides six 8” × 22” desert geomorphic boards, twelve scenarios, die-cut counters depicting British and German units and a set of overlays. The counters, map and overlay set are used for a series of scenarios set of historical scenarios depicting actions from Rommel’s unexpected offensive of April 1941. The following Special Rules apply to all scenarios unless stated otherwise via SSR.